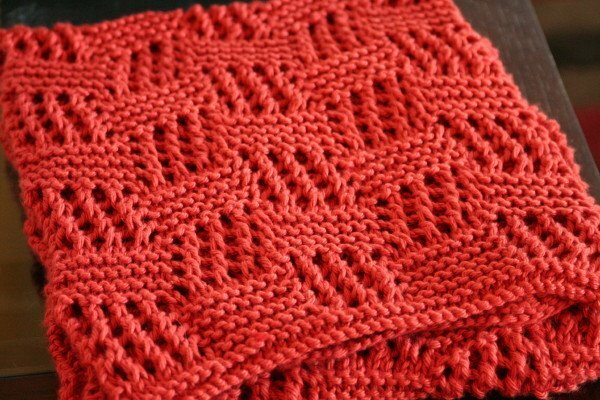 I don’t know why I like this pattern so much but I keep coming back to it. 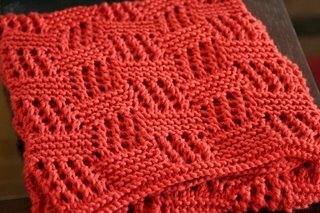 If you haven’t noticed, when I like a pattern, I knit it over and over until the amity wears out. Remember baby hoodies?? 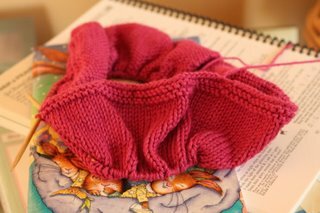 This one is Knit Picks Shine Worsted in Terracotta. 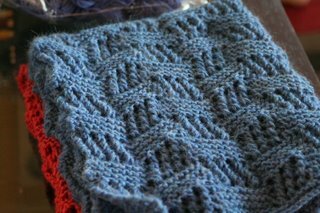 This one is Knit Picks Andean Treasure in Summer Sky. I made this for the lactation nurse that’s been helping me and Beatrix survive breastfeeding – who knew it could be so hard? That’s definitely on my Things-Nobody-Tells-You-When-You’re-Pregnant list. This is the baby tank dress that I started a few weeks ago. I’ve only made it up a few inches because I really wanted to finish those scarves. I’m not so keen on returning to it right now. It’s weird – now that the baby is here, I no longer feel compelled to knit for her. Maybe because I went overboard and now worry that she’ll never wear all the stuff I made. We’ll see. 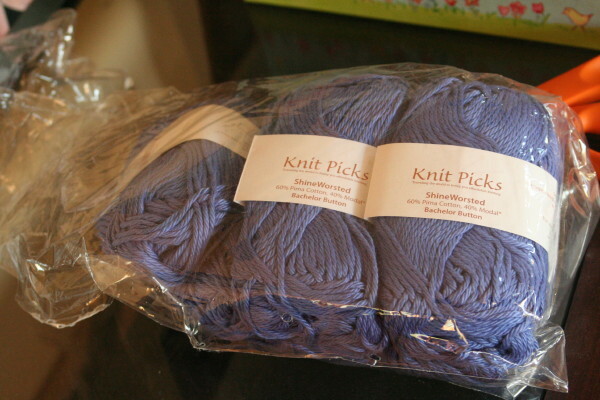 I also bought some Knit Picks Shine Worsted in Bachelor Button. It’s a bit more purple than it appears n the photo. I have 7 skeins. 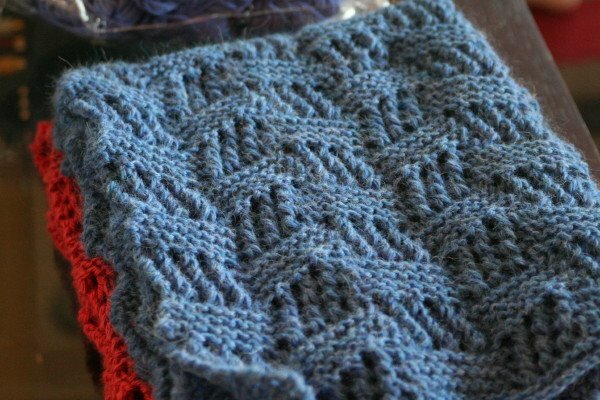 I was going to make ANOTHER Midwest Moonlight scarf but that’s kind of boring. The advantage is that it’s also mindless, which is good since you can’t do much with an infant. Any pattern suggestions? Scarf or otherwise. In other news, I got my SP9 match yesterday and I’m really excited. My spoilee and I have similar interests and lots to talk about! I can’t wait to get started. I hope to have more regular posts because I’m really missing daily knitting. I hope things calm down n the coming weeks. Everyone has told me that things get much easier at 12 weeks. Only 5 to go! Beautiful scarves! 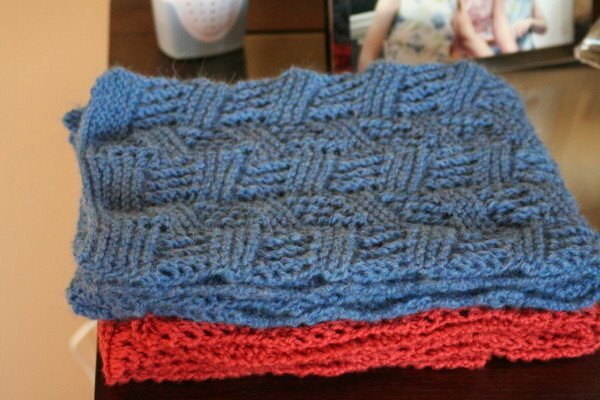 I knit one almost identical to the blue one of yours last year for myself. Double kudos for doing them as gifts – I remember mine taking a LOOONG time! I’m sorry you’ve had trouble with nursing. I hope it’s going better for you! Little B is so adorable; you really captured some hilarious facial expressions!